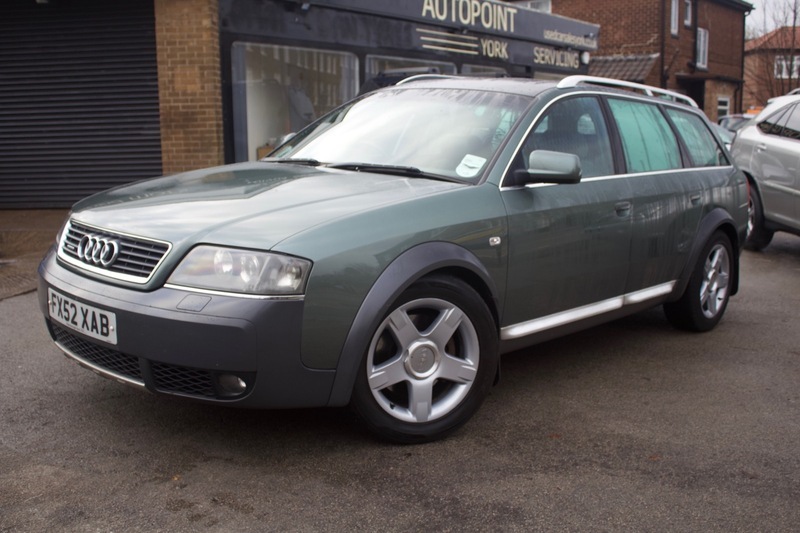 Here we have our Audi A6 Allroad, finished in Green with individual Green Leather seats. Using Audi's reliable 2.5 TDI Quattro this workhorse will get you to wherever you require, whatever the weather. With Audi's intelligent adaptable ride height, the Allroad will get over any obstacle in its way. The car comes loaded with Air Conditioning, Alloy Wheels, CD Player, Climate Control, Audi Adaptable Ride, Cruise Control, Cup Holders, Electric Mirrors, Electric Windows and Audi's Quattro 4x4 System. The car comes with MOT, 12 months Service, Warranty, Free AA Cover for a year and AA Pre Delivery Inspection Report. Finance Available on all our cars. Subject to status.